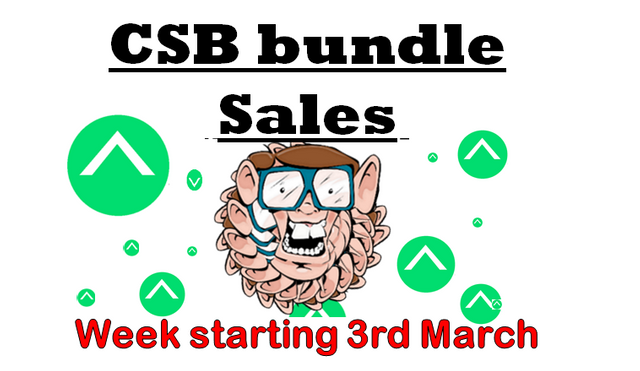 There have been a few new members buying CSB bundles but sales are far and few between. On total this week, there was 28 bundles old and 7 given away which is equal to 3500 voting SP, not a small number but not big either, it's an ok amount. Dont forget, these are great for giveaways in contests at only 0.5 STEEM each, add the receivee's name in the memo field. Nothing new are exciting happening this week in the world of CryptoSicko bundles, they will continue to be offered to people that would like to pay STEEM instead of delegating but they are a good marketing tool for me to use for giveways and at only 0.50 STEEM each, i thought that others might give them a try but 5 months in and no luck. I could have pushed them harder, i tihnk these will do well doing a bull run when everyone has lots of liquid STEEM compared to now when it harder to get. If you are interested in weekly are 4 weekly upvotes, please see more details and buying links below. Here is the new CSB bundle table. It will be updated daily to include new members and a new table will be posted every week same as before. You can see a few changes have been made and i hope it is formatted simple enough that it explains itself. What is a CSB bundle?